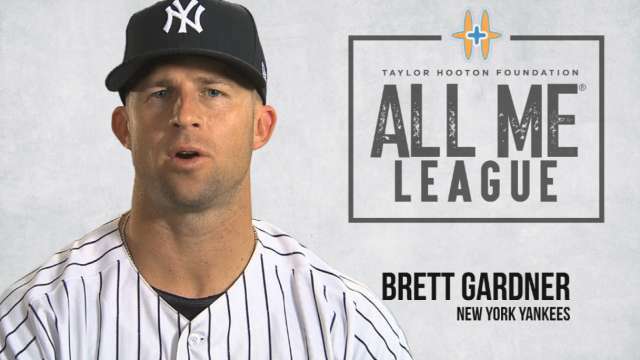 NEW YORK — The Taylor Hooton Foundation is widely acknowledged as the leader in the advocacy against appearance- and performance-enhancing substance use by the youth of America, an initiative that both Brett Gardner and Neil Walker stand behind. The Hooton Foundation’s Advisory Board currently includes at least one player from 28 of the 30 Major League clubs (the two remaining teams are seeking replacements for players who were traded or left as free agents). On Friday, the foundation announced that the board reached a record of 38 members, with Gardner and Walker representing the Yankees. Gardner said earlier this year that he believes his career path proves that young athletes can achieve their dreams without artificial assistance. The 34-year-old outfielder is the longest-tenured Yankee, having been selected by the club in the third round of the 2005 Draft and making his Major League debut in 2008. Gardner’s relationship with the foundation dates back to when the advisory board was established in 2014. He was recognized by the organization and its president, Don Hooton Jr., prior to a Spring Training game in March. To date, the foundation has spoken to more than 1 million people. It has a Latin American outreach and travels throughout the Caribbean region, speaking to thousands of RBI (Reviving Baseball in Inner Cities) athletes, coaches and parents in partnership with MLB. The organization was formed by Taylor Hooton’s family in 2004 after his untimely death at 17 years old following his use of anabolic steroids. One of the board members’ responsibilities is to provide input on the most effective ways to educate North America’s young people about the dangers of anabolic steroids and other PEDs. Not only is work being done to eliminate drug use, but Gardner says he’s been encouraged by the way MLB has responded to performance-enhancing drugs by initiating more frequent testing and stronger penalties in recent years.